Home › Comic Books › Does Krypton Soar? 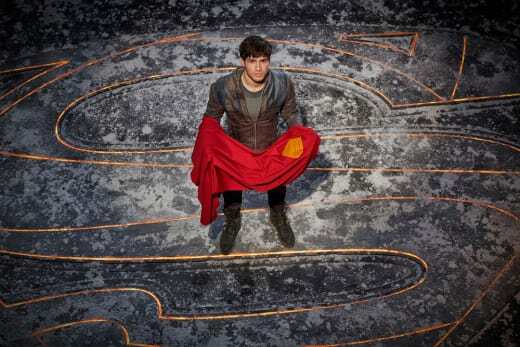 Krypton debuted on the SYFY channel this week with a family story where the past and the present collide to dictate the future. Superman’s grandfather, Seg-El, learns of an impending threat to destroy Krypton, all to prevent the birth of his future grandson. When I first learned of this new series, I wondered if it would only appeal to die-hard Superman fans. I’m a die-hard Superman fan, so, that wouldn’t bother me. However, for this show to succeed long-term, it can’t just rest on the laurels of its mythology. Game of Thrones in space is the best way to describe the tone of the show. The world building in the pilot episode efficiently establishes the state of Krypton with a hierarchy favoring religion over science. The established houses of Krypton’s society rule over the downtrodden called rankless. Krypton opens with the house of El stripped of its rank, societal influence and privilege. This was interesting because it stands in contrast to Superman’s heroic reputation while simultaneously falling in line with the reason Jor-El sent his son to Earth in the first place. Even when going backwards, the more things change, the more they stay the same as it relates to the ancestral history of Superman and General Zod. It is no secret they hate each other, but the dynamic is more profound than we ever knew. Despite an engaging narrative, none of the characters break away from the pack to put their stamp on the show. Seg-El (Cameron Cuffe) is the troubled protagonist who often can’t get out of his own way but in times of need, displays the good-hearted, valiant nature of his grandson. DC Comics fan favorite Adam Strange (Shaun Sipos) is the most interesting character by default. That is not a bad thing; however, while Sipos does nothing special with the role, he introduces the threat of Brainiac and places this enormous burden on Seg-El’s shoulders, all while wearing a Detroit Tigers hat in this alien world. If someone from the future told me my grandson would become the greatest hero in the universe, I’d have no idea how to take it. Seg-El doesn’t even have kids, yet, and now he has to save Krypton for the sake of his kid’s kid. This should have been explored and was a missed opportunity. Superman’s traditional red cape with yellow s-shield creatively serves as a doomsday clock. Its vibrant color scheme illustrates the dark color palette of the show. It will be interesting to see if it’s revealed why Superman is missing his cape. Is he hurt or did Adam Strange merely take it to prove his case to Seg-El? How do you make a show about life on Krypton meaningful when we already know the planet’s fate? This maiden voyage does an excellent job at putting all of the pieces in their appropriate place to produce an engaging story. Execution, on the other hand, despite a good start, will need to be stronger going forward. The biggest mistake Krypton can make is having Superman appear on the show. A picture or some video footage to inspire Seg-El would be fun, but he should never appear in the flesh. Otherwise, all of the steaks we need to be invested in are lost. Familiar and well-timed musical ques along with fun visuals and a sturdy narrative foundation makes this Superman prequel good, not great. Krypton doesn’t leap tall buildings in a single bound but it refreshingly focuses on the characters as opposed to hinging everything worth its salt on the Man of Steel.